Chicken Pinch is a microgame in the Strange folder in WarioWare, Inc.: Mega Microgame$!. It reappears as part of Mona's set in WarioWare Gold. There is a large set of tongs floating above the ground in the middle of the screen. The player can press the button to pinch with it. 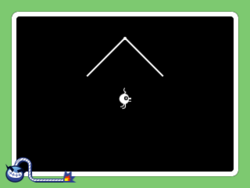 A chicken will run along the line, stopping and jumping when it reaches under the tongs, and the player must catch it by pinching with good timing. If the chicken is grabbed while doing a backflip, it will be held by the legs, instead of the whole body. 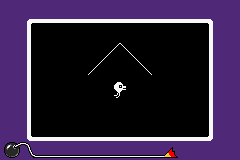 1st level difficulty: The chicken jumps three times. The last jump is a backflip. 2nd level difficulty: The chicken jumps twice. The second jump is a backflip. 3rd level difficulty: The chicken does one backflip. In WarioWare Gold, there is a possible chance that three chicken bugs appear and one of them jumps to be caught. In WarioWare Gold, the chicken bugs will randomly have a single hair on their heads. Pinching the hair counts as a failure, as the chicken bug will instantly flee. The chicken appearing in the microgame is later used in the WarioWare: Touched! microgame Cage Match and in the WarioWare: Smooth Moves microgame Bridge Work. This page was last edited on April 10, 2019, at 21:50.